BET SHEMESH, Israel — I live in Israel. My son lives in the same community as I do, along with his wife and children. Four generations of us, including my elderly mother, moved to Israel seven years ago out of a desire to join in building a safe and thriving Jewish state on our ancient land. Nothing is coincidental. In Israel, more than anywhere, one feels the presence of a larger plan. Now, only seven years after our journey to Israel, we feel that the pioneering blood in our veins that brought us to Israel is very much connected to other pioneering blood — the blood of our great-great grandparents, and for my grandchildren, the blood of their great-great-great-great grandparents. How did this wonderful connection come about? How did it happen that in this past year we uncovered the mystery of who was my grandmother’s mother, and how was it that my grandmother — my mother’s mother — came to live in Devils Lake? How was it that because of what we found out, we were able to establish a connection with Mike Connor, a resident of Starkweather, N.D., and become aware that we owe him and his family a tremendous debt of gratitude — and that between our family, the Calofs, and Mike and his family, there is a bond that has lasted and will last through the generations? Schwartz’s book is a novel that tells the story of Jewish settlement in North Dakota from around the 1880s through the early 1900s. The book is a fictional history of a Jewish family of pioneers who came to the area as a result of the land grants that were offered by the U.S. government. At the end of the book, Schwartz provides extensive information and documentation on some historical settler families, one of which is the Calofs — our family. She also discusses another book, “Rachel Calof’s Story,” a memoir by Rachel Calof about her own family, including her mother-in-law, Charadh Calof. My son and I, with the help and support of another Calof relative, Stan Calof of St. Paul, started to unravel the threads which established that my mother’s mother, Dora, and her sister, Zelda, immigrated to Devils Lake from the Ukraine along with her grandparents, Yocheved and Shalom Calof. The detective work of my son led to his moment of epiphany when he realized that Rachel’s mother-in-law, Charadh, was one and the same person as his own great-great-great grandmother, Yocheved. This information led to our planning a trip to Devils Lake. Thus, it happened that on a beautiful sunny clear day, following Connor’s excellent directions, we drove the roads and paths toward the gravesite of Shalom Calof and some 15 other Jewish settlers. Who would believe that perhaps one of the most carefully tended and honored Jewish cemetery sites in the world can be found on this untraveled road? We stood under the vast, embracing North Dakota sky and felt at home. How many people, Jewish and non-Jewish, know about this moment in history when people of different beliefs and backgrounds lived as neighbors and cared for one another because they shared dangerous and desperate living conditions? They realized their survival hung on a thread. They lived in shanty homes; freezing cold and threatening storms could wipe out crops in moments; medical emergencies with no doctor at hand needed to be handled by common sense and prayer. Most important, they helped each other through hard times marked by financial, personal, work or family worries. Standing by one another became emblematic of their feelings and their history. Thus, the connection between the Connor family and the Calof family is inviolate. It is bonded on mutual affection, respect and a shared history marking us as children of North Dakota pioneers. At the cemetery, there is a mailbox placed upon a beautiful fence to protect the graves from animals. In the mailbox, my cousin, Phil Goodman, and my son and myself, found a guest book to sign as well as a lovely photograph book called “Obsessed with North Dakota,” given to us by Shirley LeFleur, a board member of the Devils Lake Historical Society and someone who kindly reached out to us. 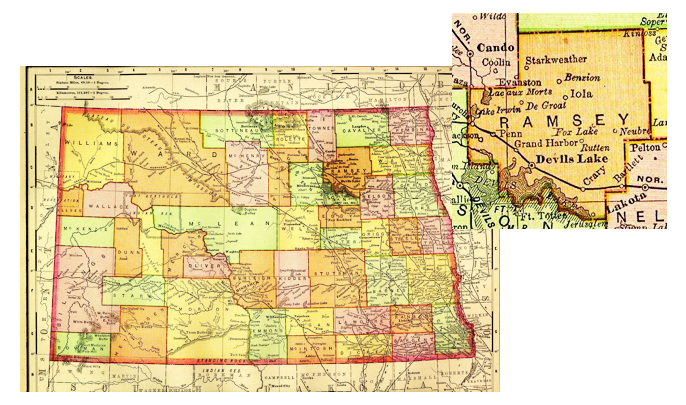 Yes, we have become obsessed with North Dakota, where the land is rich in human harvest and grows citizens who are as sturdy and as wholesome as the state’s famed produce. The pictures of our great-great grandparents, Yocheved and Shalom, now adorn our living room breakfront in Israel. We hope that we will be a credit to their memories as they enrich us by the example of their lives, their faith and their fortitude. Joanne Jackson Yelenik is a teacher and writer in Israel. Daniel Yelenik is a rabbi and lawyer.